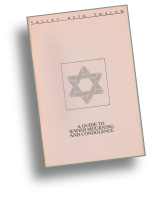 In 1982, I prepared a Guide to Jewish Mourning and Condolence for members of Valley Beth Shalom, a Conservative synagogue in Encino, California. The booklet was subsequently distributed nationally to other Conservative synagogues throughout the United States. I have recently updated the Guide and converted it into even more useful hyperlinked electronic format. The new version is now available to the community at large as a public service of Valley Beth Shalom. You can download it for personal use without charge here. You can find other helpful materials on this topic at the VBS website here.